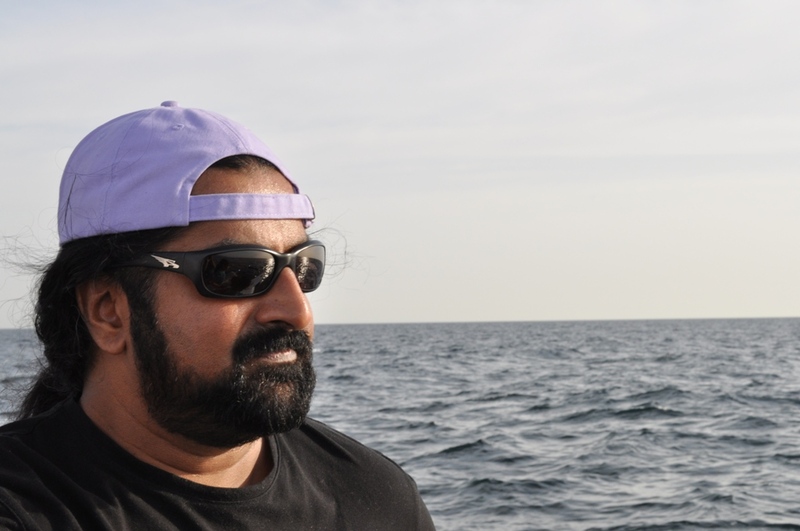 Just after the mega earthquake and tsunami on March 11, 2011, I signed up for my 2nd dolphin watch boat adventure with Captain Khalid in the sea of Oman in the western Indian Ocean. In a huge bay less than 30 minutes by boat from Bandar Al Rowdah there are tens of thousands of dolphins on this calm and inviting morning with the cool breezes brushing our faces. Omani sea-captain Khalid is a seasoned veteran of the seas and is continuously scanning the horizon looking for our target and hoping to close in on them. As the motors rev-up to about 24 knots, I was hoping to get some dazzling pictures and I was not disappointed. As we cruise into the sunrise following the ancient traditions of the sun worshiping dolphins we see boats, seabirds and dolphins towards the east. It is as if there are a huge mass of dolphins being herded in the general direction of the sunrise and we are heading further out to intersect this gigantic gathering, which we did. 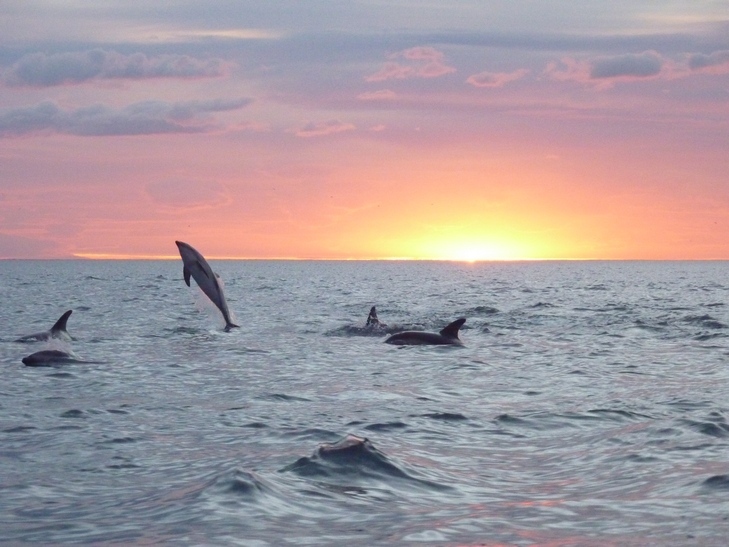 It is indeed a feast for our eyes to watch the beautiful Dolphins worshiping the birth of the new sun and another day! It is a celebration. It is an expression of gratitude, love, beingness and oneness with the universe. Dolphins celebrate the sunrise and again they thank the sun for maintaining life on earth during every sunset. Dolphins are superior beings at every level. 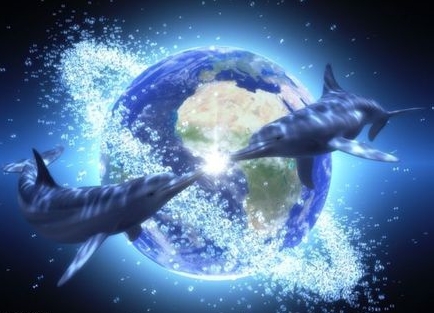 When you are in the middle of the moving and scattered mass of dolphins it is obvious that these dolphins, the descendants of Atlantis, love to travel in packs or pods. They certainly love the company of their family and cousins and other distant relations as they jump, dive and generally frolic and dance around in the sea. There were literally thousands of them there, performing their morning dance of dipping and ducking to honor the sunrise as they have continuously done throughout the ages. A few jumped clear of the water in splendid athletic displays of pure energy while many of the others, triggered no doubt by some primordial instinctual impulse, dived in pairs and threes as if to satisfy some kind of cosmic rhythm known only to them. Little is known about the Atlantis dolphins except that they are highly evolved mammals, able to communicate with the beings of Atlantis and helped to heal the people at that time. They were an integral part of the healing and higher consciousness healing that took place there during that time. Some feel that their consciousness was so advanced that they were able to create pockets of love where genuine spiritual awareness and growth was possible. In fact, many scientists believe today that the dolphin is the closest in intelligence to human beings and may be even more intelligent than humans. I am confident that there is some truth to this. They are much better than us in the realms of consciousness and higher awareness. They are certainly free in their aqueous environment as they are not chained to the realms and rigid forms of earth. Mohanji* an authentic guru and meditation master, says that if all the beings of earth were categorized according to the level of subtlety and consciousness, then dolphins and whales would be placed above humans because of their advanced level of subtlety. They have chosen a fluid form, flexible and spontaneous. They have chosen the path of greatest fluidity where their form has no rigidity and there is no possibility of resistance because all is supple and fluid in the aqueous environment. There are no rigid forms or substances in the infinitely subtle and flexible water element. The fluidity of their forms is an indication of their elevated spirituality and the message is that of an objective acceptance of their situation. Along with this situational acceptance of things as they are, the unconditional acceptance of all circumstances also signifies egolessness. No matter what the provided situations are, they accept spontaneity, fluidity and generate no attachments or resistance to any situations, which allows their unconditional egoless spirituality to manifest in the aqueous environment. That’s why they look like they are loving their environment when you observe them frolicking and swimming around the boat and each other. They, in fact, do manifest an enduring grace and the spark of God which is an aspect of their very being. Their operating level is love but not limited to their own community or species. This is an important message. Universal Love is very important. That is the remedy for all the sorrows of the world. All other levels are community oriented except the whales and dolphins who are more than community oriented because their love is unconditional and to be shared by all other sentient beings. They permeate love wherever they go and help to balance the aggression and ignorance. When we know karma, why should we resist? But who created it? 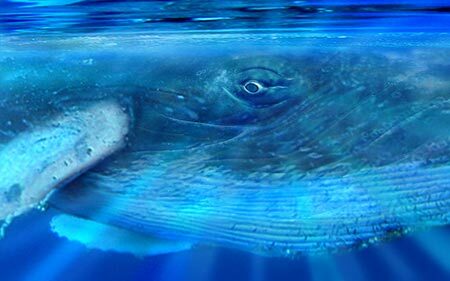 Mohanji says whales show stability in consciousness and are not as flexible in that aspect. They represent stability that is established in supreme consciousness. However, whales also manifest the qualities of continuity and support. Earth (Land) has emerged out of water, to sustain varieties of life. 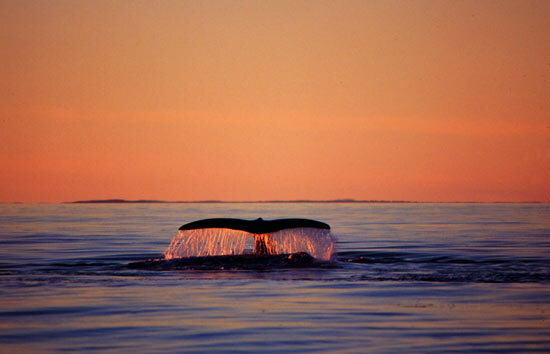 Whales present themselves as guardian angels to the earth. It is a grand collaboration. Whales help neutralize the mounting negativity that gets accumulated on the earth. Whatever the earth undergoes, whales support through their powerful songs, which are like “mantras” aimed to keep earth stable, positive and to help continue its mission of nurturing and sustaining life. This is the collaboration between earth and the whales and there are no conflicts at all, in this. Dolphins, however, are more playful and funny and actually give positive vibrations in a therapeutic/healing role where the qualities of freedom, positivity, joy and unbounded love are omnipresent. They are especially therapeutic if someone is depressed as dolphin energy can indubitably and on the nose reduce the feelings of depression. So, I ask myself, how can we ever think of killing such lovely creatures as whales or Dolphins and eating their meat when their only intention is to provide unconditional love to all. It would be radical to propose a moratorium on the killing of whales and dolphins as was done by the International Whaling Commission in 1987 because the northern countries, especially those with the huge trawlers sucking the fish out of the sea, would ignore it anyway. Are recent Pacific Rim events indicative of mother nature protesting and demonstrating against the callous overfishing and over consuming which results in more resources being wasted and squandered than are utilized, especially with the high seas freezer trawlers which recognize no boundaries? In seeking to make sense of the reasons I mused as to why, with about 60,000 km of the Pacific ring of fire ready for a tectonic event, was the epicenter of the tectonic plate shift so close to both a nuclear power generating facility and a 105 year old whaling factory which were both destroyed by this once in a thousand year/ worst case scenario event? Are there laws of cause and effect, which we know as karma, in effect at some cosmic scale which would be evident and manifesting in the devastating earthquake and tsunami in Japan? Is there a reason that Japanese whaling boats must annually kill, “for research purposes,” over 500 adult Antarctic Minke whales (with over 50% being pregnant females) every summer? Is there a reason that the Miyagi coastal whaling port in the city of Ishinomaki in the district of Ayukawa on the southern tip of the Oshika Peninsula, which had been in continuous whaling operation for 105 years, was completely annihilated along with 500 of the roughly 1400 residents and 80% of the 700 houses in the recent tsunami? Is there any connection between the needless annual slaughter of hundreds of pregnant female whales known for their nurturing and sustaining qualities and the complete annihilation of this century old coastal Japanese whaling base? The recent Tsunami even threw ashore three large whaling ships far into the land, during its fury. It destroyed the whale processing units completely. Nevertheless, it does seem to make sense to protect those beings that manifest unconditional love, freedom and positive acceptance of things as they are. For the relatively small amount of whale and dolphin meat that we eat, are we experiencing the cosmic decisions of a wrathful god who has had enough and is teaching us some kind of lesson? Remember that a lesson which is not learned will be repeated over and over again in another way until it is learned. Was the great flood real? The Japanese situation is indeed devastating, but so was the great flood, the extinction of the dinosaurs and the annihilation of Atlantis by a comet with the subsequent tidal wave and flood. You know that the earthquake and tsunami zone is the entire ring of fire which goes on for tens of thousands of miles, so this was no more a random incident than the great flood was a random incident. We must learn the lessons here – go back to the earth and conserve our bounteous resources and stop sucking all the fish out of the oceans and polluting the oceans at the same time. Try to wake up and get off the treadmill of more and more by using vastly less plastic and reducing our carbon footprint. There have been 5 incidents of mass extinction over the eons and the question here is whether or not are we heading for or at the start of mass extinction No. 6??????? Lots to ruminate about during these times! Are we going to learn anything from this Japanese catastrophe? You are probably asking why Japan still hunts whales. Well, Japan argues that it is a cherished cultural tradition, and they don’t agree with the criticism that killing whales and eating them is barbaric. According to a Humane Society International report, Japan claims that they hunt whales to feed their hungry population and they started doing this during World War 2. They say that this ‘tradition’ will continue because it is their tradition to do so. They apparently do not recognize the 1987 treaty which established a moratorium on the hunting of whales, or they navigate around it by saying they must kill 500 mature whales to complete their research. Some scientists believe that the Japanese rarely eat the whale meat, and you don’t see it on Japanese dinner tables, you can only find it in restaurants and markets. As of one month after the earthquake and tsunami, the continuing series of 6.5-7 range earthquakes are the continuing wake up calls to the Japanese who are again blatantly ignoring these messages. Stick around, these lessons will be repeated in one form or another as the nuclear poison continues to pollute the sea around Japan as of a news report of May 5, 2011. The more insensitive we are, the more suffering we can expect. The nuclear reactors are still out of control and a 20 mile zone around the non-functioning nuclear power station has been evacuated. It took the Japanese over thirty days to publically admit that the situation is still out of control and the extent of the nuclear incident consequences are continuing to unfold. Along with royal weddings, a Canadian majority government, continuing massive unrest in the Middle East, especially in Syria and Yemen, let’s not forget that the nuclear radiation continues to unabatedly poison an increasingly larger portion of the Pacific Ocean with who knows what ultimate consequences to mankind. Now it will only cost about 12 billion or so dollars and take 30 years to shut the whole crippled nuclear facility down. Of course that work will go to the same companies that built the nuclear facility by cutting corners to preserve the bottom line in the first place. Are we really learning anything here? Let’s see if some of the other northern nations that are also killing whales for ‘research purposes’ will lend them their boats so the Japanese can make the journey to Antarctica this summer and continue their ‘tradition’ of indiscriminate slaughtering and selling of the whale meat thinly veiled as research. This time the rationale can be that they genuinely need the food to feed their people in a genuine catch-22 situation. ** The ideas and opinions expressed in guest posts are strictly those of the post’s author. This newspaper report is provided as background information to my story on dolphins and whales. More than half the whales killed by Japanese whalers in the Antarctic last summer were pregnant females, the Humane Society International said today. The group said that of the 505 Antarctic Minke whales killed, 262 of them were pregnant females, while one of the three giant fin whales killed was also pregnant. The findings came from a review of Japanese reports from their most recent 2006-07 whale hunt in Antarctic waters and were released ahead of the resumption of a Federal Court case the HSI is taking against Japanese whaling company Kyodo Senpaku Kaisha Ltd. “These are gruesome statistics that the Japanese government dresses up as science”, HSI spokeswoman Nicola Beynon said in a statement. The official reason that Japan gives for whale hunting is “scientific research”. They say the only way to determine the whale’s age is to kill it. The purpose of the “research” is to prove that whale populations have improved enough to allow commercial whaling which was banned by the International Whaling Commission in 1986. However, the whale meat is sold as a delicacy. It is likely this is the real reason for the whale hunting. 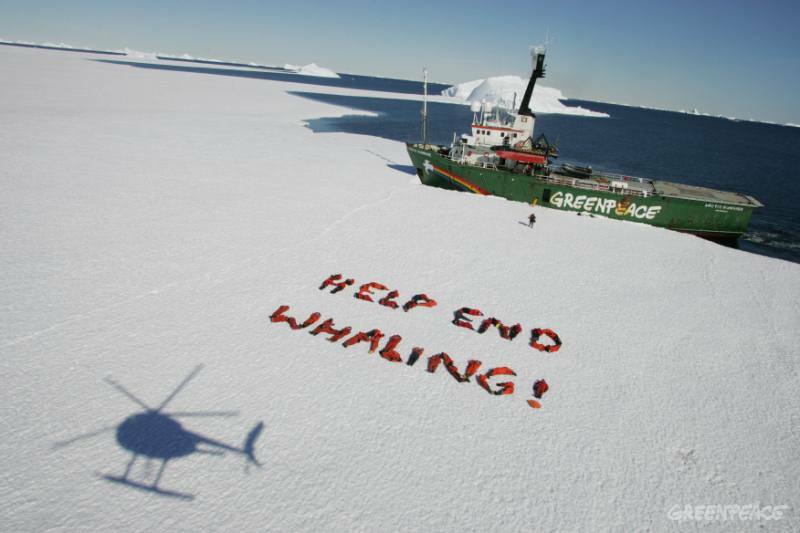 In recent years activists have disrupted whale hunting in the arctic. Whaling in the world is now banned. Whales were considered threatened in 1950, then endangered in 1963 and their hunting was banned in 1986. That’s 25 years ago. There are some countries that still continue to harpoon whales. Japan has a long history of harpooning whales, and is currently aiming to hunt a total of 1035 whales (which will be one of their biggest catches in 2 decades). Some of their whaling is in the near Antarctic Ocean, and a few boats near the Australian Border. Australians are trying to stop them, but the Japanese say that they are doing this for scientific research. People are certain that they are using this for their medicine, using the Whale’s oil, and the rest are used for their sushi, which is a popular dish in their country, and other dishes as well. The whales that they target are the hump-back whales, which have a lot of oil in them. Once they are cut open, Japanese scientists check their diet to see if they are eating right. If not, they throw it back it into the Sea!!!!!. The White Hump-back whale isn’t the only whale they are aiming for; they are also targeting grey whales & Minke Whales, which can be found in the Antarctic Ocean. The Green Peace group in Australia is protesting that Australia should help other organizations to stop Japan’s whaling; Kevin Rudd is currently setting a plan to spy on the Japanese whalers. The countries that are currently opposing Japanese whaling are the United States, New Zealand and the United Kingdom. Kevin Rudd has sent out planes and boats to where he knows Japan is whaling in Antarctica to collect evidence that they are not using them for scientific reasons, but to use them for their own use. Also, there is a boat called the “Sea Shepard” a boat that will chase, block and harass if they see any attempts to harpoon the hump-backs, they already have destroyed a fleet in the Antarctic Ocean. Let me warn you. This could be unbelievable to many of you. While I write this, I already know the possible responses that I could get from many of you, after reading this honest account. Life is full of surprises, if only we have the eyes to see them and mind to believe them!. Usually, just like the Bedouin hunters cover the eyes of their hunting falcons and open them only when they spot a prey, our mind and intellect does not allow us the freedom to see objectively. It is only when we nurture lack of expectation that we can enjoy each little surprise of life. But, in this case, it was far more serious. It was a question of life or a question of death, or may be a question of life and death. In short, life and its dimensions were displayed to me, once again, through a practical lesson on existence and how it works! 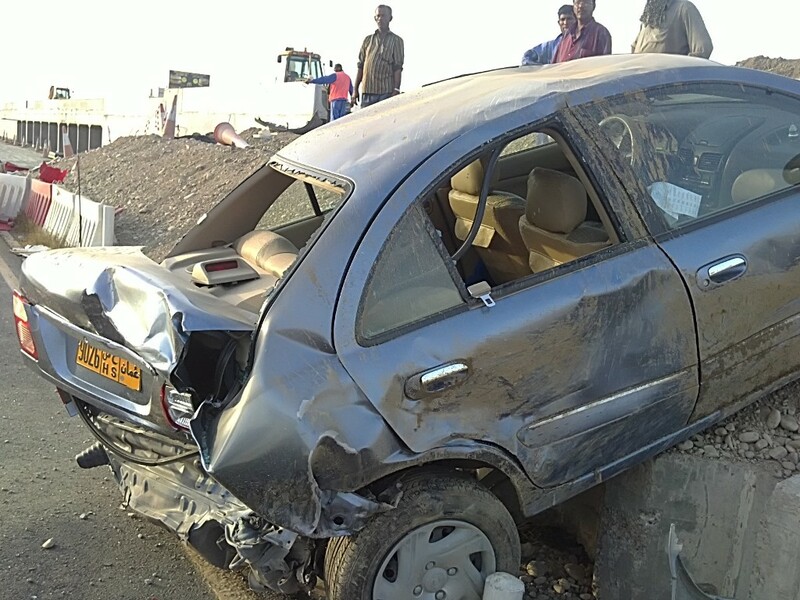 This is a true story of a serious car accident I was involved in, where my faithful car has been declared a total loss, and in which Mohanji and Shirdi Sai Baba gave me rebirth. I always seem to have some stories about miracles to share with you. Believe me, I am not looking for it. It is happening to me in real life! Mohanji has truly made my life full of exciting and transforming events. And I feel the only criterion for the immense grace that I literally experience everyday has been my sincere efforts to lead a life of relative purity and unquestioned faith in him. He has asked me for nothing, till date. It was the 2nd of May 2011, Monday. Mondays are usually extremely busy days at the hospital where I work. After finishing all my work, at 4.30pm, I set out to plan some upcoming travel arrangements. The travel agent office near the university was my initial destination. Later, my husband Dr. Sanjay and I were supposed to go for our weekly shopping trip. The week before had been hectic for me. Mohanji came back from his Europe trip. My son Mohanish came from India to spend a week with us. My daughter Moushami had decided to shift her studies to India and was leaving our house, lock, stock and barrel. It was indeed hectic. So many details to attend to, plus the mounting work at the hospital, teaching students, attending to patients – well – I believe you get an idea. My kids went back to India on the 30th of April. It was indeed a hectic week and since the kids had left for India on 30th April, we had not had any time to go for routine shopping of grocery and vegetables. Sanjay goes for meditation to Mohanji’s house every day after work. He is very dedicated. 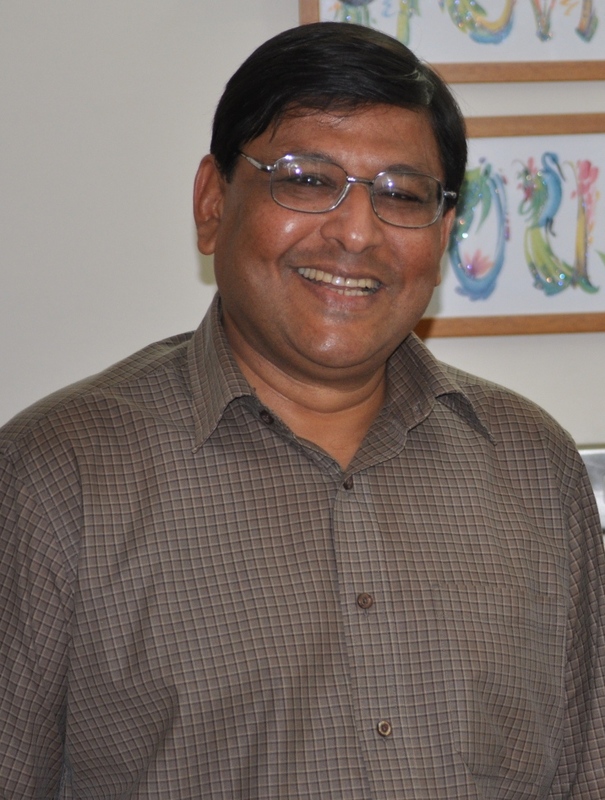 Sanjay works for the ministry and finishes his work by 2.30PM. Soon after his work, he goes to Mohanji’s house and usually meditates there till late afternoon. Mohanji will not usually be there, as he works until 6PM. This means, they do not necessarily meet each other every day. I called Sanjay. We decided that, I should go to Al Khuwair which is around 30km away from the Sultan Qaboos University campus where I live. He would meet me there. This is half way between Mohanji’s house and our residence. I started for Al Khuwair after finishing my work with the travel agent. I drive a Nissan Sunny, 1.8litre or 1800CC car. This has been a very lovely and faithful car that has served me since 2003. I was alone in the car. The time was around 5.30pm in Muscat, Oman. Oman has left hand drive. Extreme left is the fast lane. I was driving on a road with three lanes. This is a new road under construction. I was in the middle lane but I wanted to change into the right lane. A big 4WD was behind me at an absolutely safe distance so that I could enter the right lane. I looked for clearance and changed into the right lane. There were no cars in front of me, neither in my lane nor in the other lanes. The road was empty, which is also unusual at that time of the day!!! Let me first simply describe the accident as it is, then I will enter into the subtle details. Suddenly, the 4WD behind me hit my car from the right side. The impact was tremendous. My car rose into the sky and was thrown towards the extreme left lane across the road. 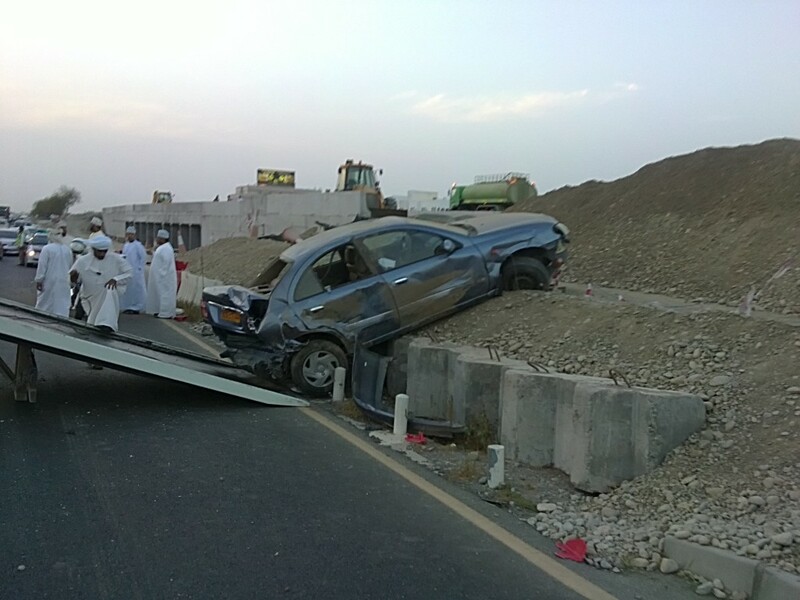 The car landed on the heap of construction sand laid along road side. (You will see this in the picture.) It is now hanging at the edge with the front of the car resting on the sand. In this tilted position, with that impact and torque, at longitudinal axis, the car rolled 3 and half times and then stopped. This all happened with great impact in a few seconds. Once the car had stopped, I checked whether my head was up or down. Great, it was up!. Then, I checked if the door could be opened or not, or if I would have to break a window. More good news, I could open the door. I removed my seat belt and coolly walked out of the car. My dear friends, what an accident! What do you feel about the accident? How am I alive to write about this accident? Ha ha…. I am alive and perfectly fine. People gathered around in no time. As I walked out, I coolly stood by the car in the sand, my mind was blank. No emotions or panic. I had a confident look at my car and surroundings. I was not trembling or shivering. There was no anxiety or palpitations. I was alive! Strangely enough, I was feeling more settled within. I felt extremely light. I wondered. There was only one small scratch on the back side of my right hand and abrasions at the location of the seat belt. No other injuries or aches. I saw my car. The car was fully damaged except for its steering wheel and my seat!! Amazing! At the same time, people around me who had seen the accident happening and were shocked about the sight, had both their hands up towards the sky and were saying… Allah karim, Allah ke duwayen, Allah meherban, Allah karishma, what a miracle, God is great, Inshaallah, Hamdullilah, you are blessed, Jesus, Bhagawan tumhare saath hai (God is with you). I was touched by these expressions. One man actually asked me, “Are you the lady coming out of this car or are you her ghost?” The people around helped me to get my purse and handset from the car. Everything was intact. My spectacles however had only one glass remaining, that of my left eye! The right glass was missing. After a few seconds, I made my first call to Mohanji to thank him for saving me, but he did not answer the phone. I thought he must have been in the office attending some meeting. Then I called Sanjay. He appeared superbly composed. Within that time, I had a missed call from Mohanji’s mobile number. I called Mohanji back. His expressions always puzzle me. I said, “Mohanji what happened? I met with a horrible accident. Thanks for saving me”. With calmness in his voice, and with a perceivable cute smile, a short brief laugh and affirmative gesture (Hmn Hmn), he replied, “So mom, how are you? What shall I do next for you?” His powerful voice and words…. “Next for you”…. told me that, this was no ordinary accident. I asked him to send his driver Firoz. Let him pick up Sanjay on the way and reach the accident site. Firoz had to drive 55km to reach me. Within a few minutes, the police arrived with two ambulances. Traffic was halted by this time. The paramedics had to execute their protocol. I was taken inside the ambulance. He asked, “Any aches and pains, swelling, injury?” I said “NOTHING”. He checked my blood pressure. It was 130/80mmHg; my heart rate was 72 beats per min! Both, paramedics were shocked. He said, “This is impossible. You have no reaction; there is not even trace of anxiety, shock or fear of the accident or death. Are you sure you have no injuries, any headache or nausea?” He was not convinced. He checked all of my joints, my head and full body. He found nothing. The paramedic said, “I have never seen a person being saved from such a terrifying accident and there is no shedding of even a drop of blood! This is a miracle!! !” They insisted on me being admitted for observation as there could be internal injuries, but I politely denied and as a formality I signed the discharge against medical advice papers with a note of thanks for prompt help. I was eager to meet Mohanji and thank him. We reached Mohanji’s house that night at around 9.15pm, after finishing all the formalities with police. Mohanji was watching TV, sitting in his favorite rocking armchair. Noticing my footsteps, he came out. He gave me a big hug with his trademark smile. There were no words, yet he communicated everything. The striking fact was that Mohanji’s body was extremely warm, much more than usual! I understood – he was not in his body!! He was working outside, beyond his body! He was in a highly expanded state of consciousness which he usually operates in (those spiritually inclined will understand this). What I have described till now was the terrestrial expression or manifestation of the accident. Many questions were raised. How could I describe my accident so vividly? How do I remember every step of the accident? What made me feel “settled and relaxed” after the accident? Where was the anxiety or fear or other emotions, which are quite usual with every accident or at least an accident of this magnitude, where my car was a total loss? How come only the steering wheel and my seat were kept intact? Usually, with such impact and high atmospheric temperature of about 40 degree Celsius, petrol tank could burst and fire could happen. How was the car saved from fire? Why did nothing happen to my belongings? Why did my body have no injuries or aches? Why were there no cars in front of me either in my lane or in both of the other lanes? Why did nothing happen to the other car and person driving? There were so many workers around, how come everyone was kept safe? Most importantly, why was I alone in the car? My husband and kids were kept safe. Why was Mohanji’s body so intensely warm? I admired the precision of the Divine and the Higher Masters in organizing this accident and my miraculous escape! …..“With the sudden bash from behind, I was pushed forward towards the steering wheel. The only thought that came to me at that time was that I was meeting with an accident. Believe me, I saw my accident happening. My car was thrown up and to the extreme left and then projected up onto the sand bank. There was another big jerk. I thought I was completely conscious. I was glued to the seat and steering wheel. I did not move a hand or leg. I did not move any part of my body. I remained frozen in the seat. Then, the car suddenly took one complete turn. I saw everything moving around me. I kept quiet. I thought now the car will stop. But no, it rolled again. It was okay for me. I thought it might stop now, but it rolled again completely. Then I decided just to witness. It took another half turn and stopped with a big thrust. When it stopped, I did not really believe it, and was expecting another roll! But, no, after this time the car was finally still. It did not move. This is the moment when I checked whether my head was facing up or down! 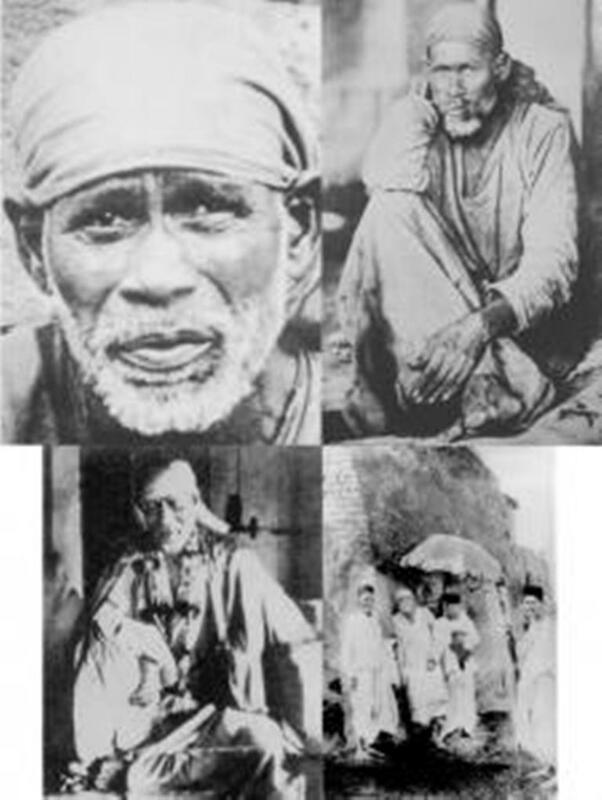 In reality, as the 4WD bashed into my car, I saw Mohanji and Shirdi Sai Baba holding my soul. I saw on one side, the rolling of the car, and on the other side, Mohanji and Baba holding me (my soul) straight. Amazing sight! This was an “Out of Body” experience. I was so safe there. I had full FAITH in them. My soul was out of the body and was watching Deepali’s physical body and car undergoing the accident. You can imagine my physical body as a doll and the car as a toy car; both rolling together 3 and a half times. When the car stopped rolling, Mohanji and Sai Baba put my soul back into the body smoothly. I came back to Deepali consciousness and looked around to see if my head was up.”….. In the earthly sense, I actually died and took a rebirth. Mohanji said, “Till we were holding your atman (soul), it was only AWARENESS. It was 360 degree vision for you. This is the most subtle state. It was a perfect WITNESS state. So you could see everything around you.” I know every bit of that situation. There was no mind. There was no analysis. Hence there was no anxiety or any reaction to the situation. Mind gives emotional reaction to the situation. My mind had stopped functioning. There was no ego. My atman, soul, was taken out by Mohanji and Sai Baba; only the body which is an instrument for the atman underwent the accident. Once the car stopped, the purpose was over and they delicately put the atman back into Deepali’s body. And, the new Deepali came out of the car. I felt new and totally different when I came out of the car. I was relaxed and composed as if it was just a small incident. Mohanji must have done a lot of karmic cleansing for me. Mohanji reminded me that the three and a half rolls of the car represent the three and a half coils of Kundalini. Was this a co-incidence? Obviously not! Only Mohanji can give deeper insight into this. Knowing him, I know very well that he works in silence and usually gives no explanation. The day I had to meet with this accident was also a Divine game plan. The 2nd of May 2011 was Monday, the day for Lord Shiva. It was the 14th day of the waning phase of Chaitra, the first month of the Hindu calendar. It also happens to be the day of Darsha Amavasya and Somavati Amavasya. When the “no moon” day falls on Monday it is called Somavati Amavasya. This is a very auspicious day and this day may come at the most 3 times in a year. One is supposed to observe fast and have bath in the River Ganga. On Darsha Amavasya, the astral plane is very close to the earth. Offerings are made for the departed souls and their blessings are sought on this day. This is also very auspicious. I was taken to the astral plane on that day and sent back. I was given rebirth for a purpose, on this auspicious day. After rebirth, I did go to “Ganga” and have a bath. Meeting Mohanji is everything for me. Mohanji is the conglomeration of all sacred rivers, Gods and energies for me. Visiting his house and bathing in his presence and energy field was just like visiting Ganga for me. Moushami reached Pune on April 30th. She was missing me a lot, as she had not stayed away from me for too long, till date. The same night she had a significant dream. In her words, “You and I with Mohanji climbed up a mountain. We reached the peak. Then suddenly Mohanji threw you (Mamma) down. Mamma you were dead. I saw your body. I was shocked! I cried and cried. I cried that night alone, as everybody around was sleeping. But, from the next day, I stopped missing you as a mother. I am fine! I am independent and do not need you physically with me. I know that my mamma and her energy is always with me.” Her dream touched me, but I also thanked Mohanji for the ease with which he made Moushami, a small girl, free of the emotions that were attaching her to her mother. As Mohanji says “dream state is also real. There are no boundaries and conditionings in that state. Expressions can be more candid. Cleansing of karma happens faster in dream state”. Again, it is Master’s plan. Without Moushami and Mohanish being emotionally independent, I as a mother, would not have been able to leave my body easily. This is a big shift. I had two deaths in two days. Emotions bind one to the body and make one gross. No emotional binding with kids anymore. They have taken birth with their own agenda and we, as a parent can only support them and guide them objectively. 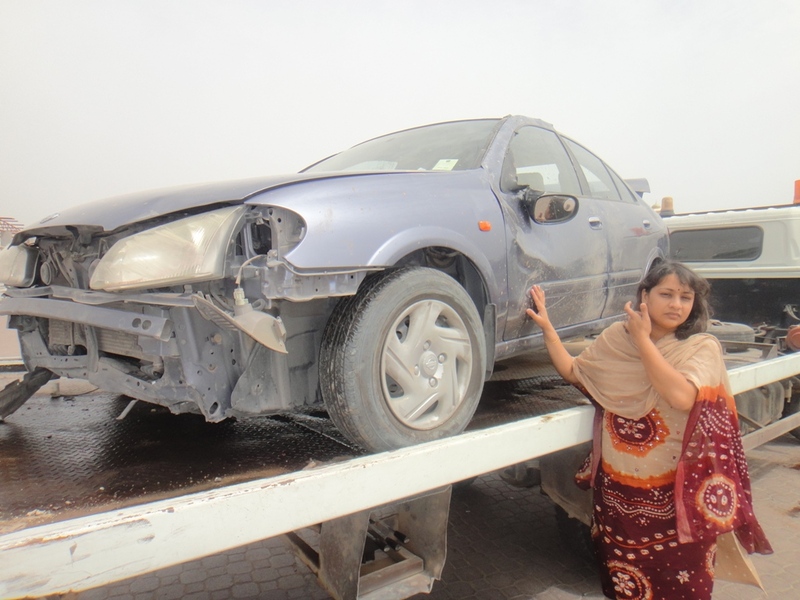 When the 4WD bashed my car, certainly there was a thought that, I am meeting with an accident. But, there was no anxiety, no fear of death, no emotions for self or family or kids or anyone. There were no desires. There was no attachment to the physical body. There was no feeling of incompleteness. There was no analysis. There was only awareness. What an exit from the body!!! Can this only be called DEATH? I actually experienced true liberation in those few seconds. Reflecting back, since 28-29 April, I was experiencing certain rather strange feelings. It was as if I am about to embark on a long journey. I was concentrating on completing my work. On April 30th, my daughter Moushami left for Pune. She will continue her studies there. Until then, she lived with us. This is like one phase is over in my life. Mohanish, my son, is already in Pune. Both kids will be independent from now onwards. I was completing work in the office, house, and at all levels. On May 2nd itself, Sanjay and I gave big donation (daan) for a very genuine cause. There is a custom of daan before departing, in India! That too happened for me, without any planning of any kind. After finishing my work at the travel agent, I sent an sms to Mohanji, “I cannot come to your place today evening.” This was around 10-15min before the accident. He replied, “I am not important. Mission of liberation is important. Your job is to take care of the mission.” This was a significant reply to me and he had never mentioned these words before so strongly! But, the accident brought us back to Mohanji’s house and presence. That night, Sanjay and I stayed at Mohanji’s place. Next day, when I got up, there was a deep feeling that, this was day 1 of my new life; this was the beginning of my Dharmic life. I was feeling liberated. I could not perceive much of the Karmic entanglements anymore. It was more like the relief of a tough job, well done! I then understood Mohanji’s sms reply. In the Power of Purity meditation we are guided to offer gratitude to all INANIMATE objects which have served us in this and past lives. Sanjay and I went and bowed to my Nissan Sunny. It had suffered from impact everywhere except my seat, steering unit and the roof. She was my family member. Mohanji always says “Everything has a purpose in life.” How true this was, for my dear faithful car! 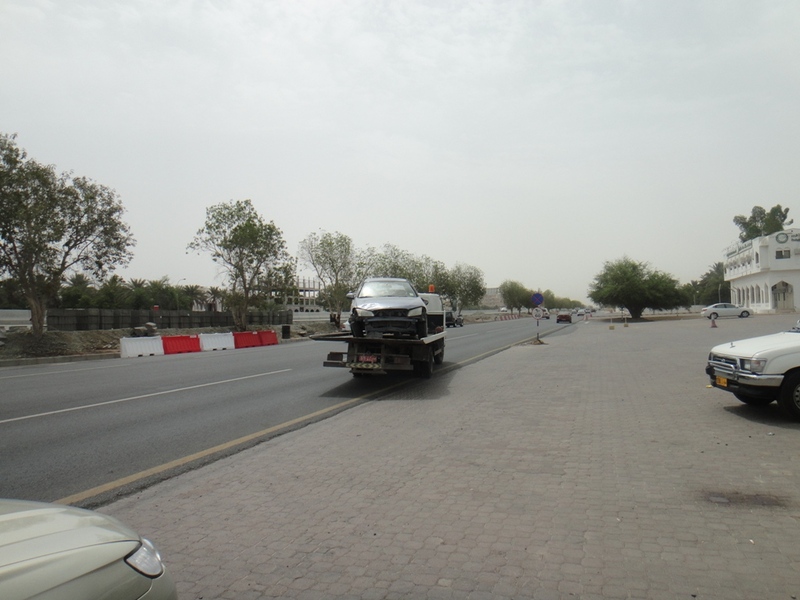 Within one and a half months of my landing in Muscat on 14 April 2003, I procured my driving license after my first attempt (ask any expatriate living in Oman, what an ordeal it usually is, to get a driving license in Oman) and bought my car on June 19th 2003. Sanjay came with Mohanish and Moushami, who were then 13 and 4 years old, at the end of June. The car supported me throughout the kids’ formative years. 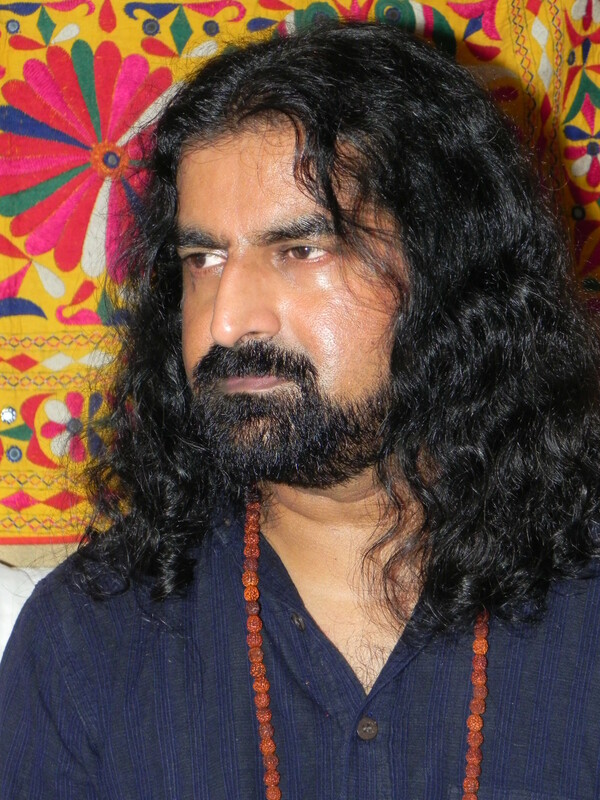 Mohanish left for Pune to pursue his musical career in 2008. Moushami also left for Pune with our house maid Mumtaz on April 30th, 2011. My Nissan Sunny’s role in this phase of my family career was over and she departed two days later! Physical Death is always a juncture. A new body that the soul will take is always for higher or different reasons. There is always a certain limitation in spiritual evolution when karma is strong. So, the soul exits the body and creates another body to evolve further. When my soul exited, it was death. When it re-entered, it was another life. Masters stood guard by my body and soul. So, there was no confusion. There was extreme precision and supreme planning. Near Death Experience is always a shift in consciousness. I changed my track, but remained in the same body. What a beauty! In a way, the tasks related to my “past life” are over and I resumed the journey, using the same body, taking on new tasks of much higher and selfless nature. Being a medical doctor, to me death means cessation of the body’s biological functions like respiration, circulation etc. But this rebirth experience gave me the confirmation that the soul does not die. It only changes the body. Life is a continuous phenomenon. Thus, death in real terms actually does not exist. There is an in-depth and advanced meaning to all this, but I need not explain it all here. Being spiritually inclined I knew this concept and now Baba and Mohanji have given me an experiential understanding. Interestingly, in India, on May 2nd, Mohanish was in Mumbai to play tabla (Indian percussion instrument) as an accompanist for a masters’ exam (MA) in Kathak dance. He had been travelling for the last 2 days after leaving Muscat and hence was quite tired. What a coincidence!. 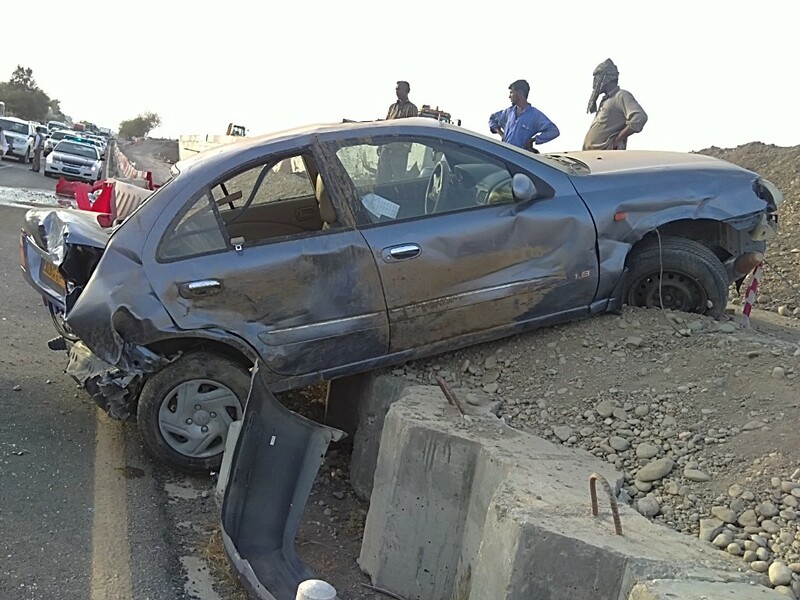 The exam started around 7pm in India which was the same time I met with this accident. Interestingly, the panel of examiners gave the topic “Pootana Moksha” (salvation of Pootana) to the performer for extempore performance. Mohanish was playing the rhythm pertaining to salvation on his instrument at the same time that I was going through this accident experience! Pootana Moksha is a story of how Lord Krishna gave salvation to the demon Pootana. When Lord Krishna was a few months old, Pootana was sent by Krishna’s maternal uncle to kill Krishna by breast-feeding Him with poison! Instead, Baby Krishna gave Pootana her salvation! Pootana represents the tamas or inertia. The Lord removes all tamas and installs supreme brightness in the person attaining salvation. My death and nearly at the same time my son performing on tabla with beats for salvation, liberation or moksha! I offer gratitude to all those who helped me physically during this event. Mr. Hilal, Sanjay’s colleague and Mr. Balaji, my colleague who came running to the site. Mr. Salem helped a lot with police papers and insurance completion. How can I forget dear Firoz! Without him, moving around to complete formalities was just impossible. I thank my department for its support and kind consideration. I thank all my friends from the university and outside for their best wishes and concern. Many asked me to visit temple and make offerings to God and do charity for poor people. Some known to me actually distributed food on my behalf. Some visited temple too. Everyone thanked God for keeping me safe. I thank everyone. I understand your concern. I visited Mohanji. He is my shaktisthal (centre of energy, spine). One of Mohanji’s main messages is “Help the Helpless”. Sanjay and I have been doing that regularly. I also thank the 4WD and the person who were instruments used by the Higher Masters just to give me rebirth!. In the police station, I actually thanked him. I thank Mohanji for keeping him and all workers around the accident site safe. Masters work so beautifully and with precision. This accident was made to happen. Sanjay and the kids were kept safe. Any second person in the car would have surely died. My seat, steering wheel and the roof of my Nissan Sunny were kept intact to save me. The person who hit me was also kept safe. No other cars were on the road at that time. All workers around the road construction site were kept safe. Because my soul was out, my bodily functions did not get affected. Heart rate and blood pressure were normal. This body of Deepali must have some higher purpose, so it was kept intact and not damaged in terms of injury or fractures occurring. I had a little neck pain for a day, I have no other aches. Everything that this body needed was kept intact. Funny, the next day, Sanjay also found the glass for the right eye of my spectacles intact in the car, not even a scratch on the glass! Precisely, only my car underwent the impact and gracefully like a faithful soldier it took all the brunt to save me. I bade it goodbye with tearful eyes. Everything now sounds so simple. Routine life started the moment I finished with the official paperwork for the accident. Mohanji also took away the trauma associated with the accident. He took away all of the associated emotions. When Mohanji works on you, you will not realize that he is working on you. His happy, casual and jolly nature is truly deceiving. His casual talks are not actually casual. His energy works for your upliftment remotely, while he will be talking about something else. With complete gratitude and surrender, I offer this new life for the Dharma and for the mission of uplifting humans to help them achieve liberation. The basic purpose of human birth is to achieve liberation (moksha). I offer this life to Masters to let them execute their purpose through this body known to everyone as Deepali. The Eligibility factor: Why Deepali was the chosen one by the Divine and Higher Masters? Our family meeting Mohanji here in Muscat was a part of the Divine plan which transformed our lives. Mohanji always says “The form of the Master is not important, live the teachings of the Master. 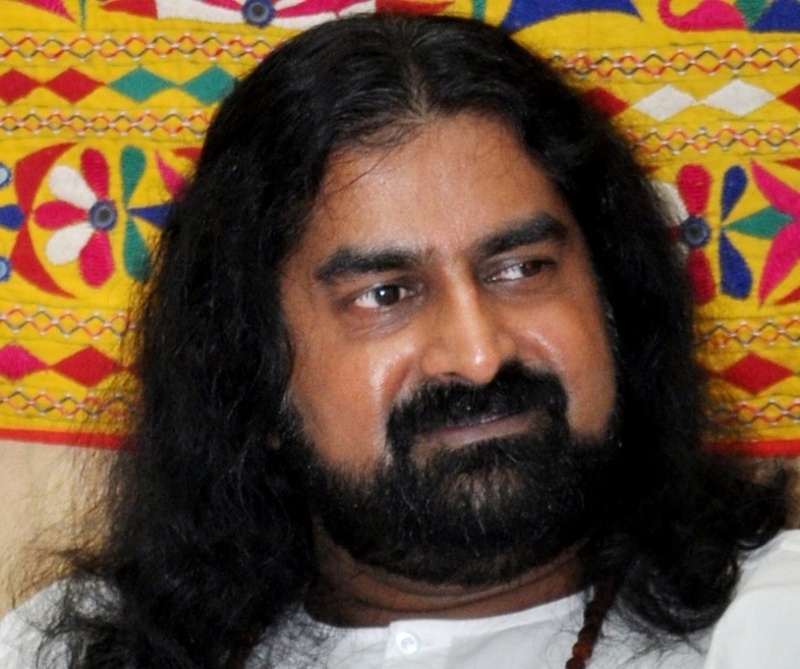 Be one with the consciousness of the Master”. Deepali operates in this consciousness and lives the teachings of Mohanji, Shri Shirdi Sai Baba, Bhagwan Nithyananda (Bade Baba) and other Masters. I offer gratitude to Mohanji and all the Higher Masters for considering Deepali eligible and elevating Deepali for a higher purpose and mission. Mohanji said that the Masters needed to give a sudden jerk to the physical form known as Deepali so that they could work to elevate her soul for her new life which would be purely meant for Dharma. They made this accident happen on the auspicious day of Somavati Amavasya which from now on will be Deepali’s birthday according to the tithi (Hindu calendar).